Golden yellow, single flowers that reach up to 4 inches across, with contrasting small dark eyes. Showy in the garden and fine for cutting. 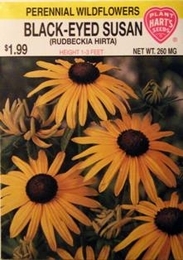 Black-Eyed Susan flowers all summer when planted in full sun. Plant in garden where they will bloom year after year. Planting time - Early spring to early winter.